Today’s market offers a large variety of portable charging stations, all designed to suit different needs; from mobile power users to the OCD’ers who just want to have their phone or tablet constantly at 100%. We decided to review three portable charging stations, namely the RS Components Power Bank, the RavPower Luster Mini, and the RavPower Dynamo On-the-Go. The RS Components Power Bank has what one would call an ‘Industrial’ Design – simple yet effective. A black, rectangular case with the USB ports on one end and a large button on the top, surrounded by 4 LEDs. The LEDs serve as ‘Power On’ indicator, less than 30%, between 30% and 80%, and over 80%. The latter 3 also flash in sequence when the gadget is charging. The Power Bank comes equipped with over discharge, over current and short circuit protection. Whilst recharging, the 3 LEDs will blink or light constantly depending on the charge percentage the gadget is at. 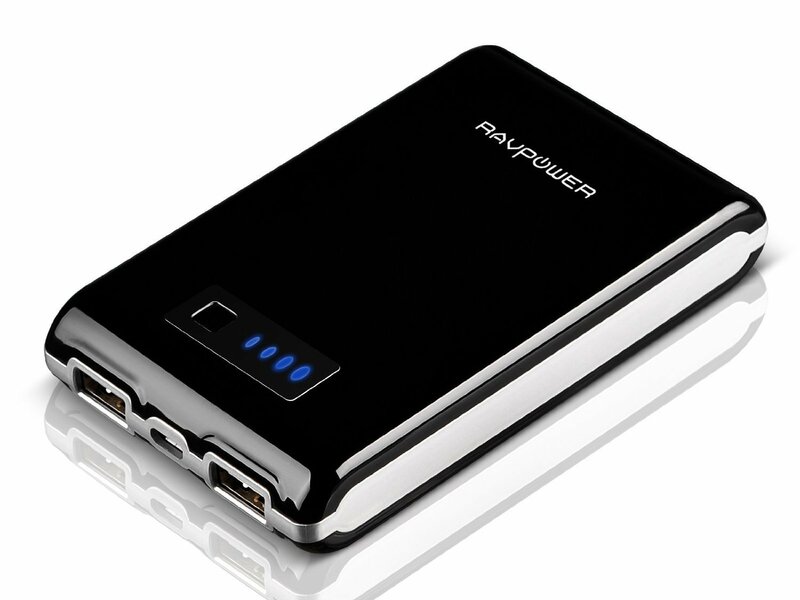 The RavPower Dynamo has a similar design to the RS Components Power Bank with an added silver steak around the side and rounded corners at the front and back. The button at the top serves a different function to that on the Power Bank; serving as a ‘Show Charge Status’ instead of a ‘Power On’ button it. So how do you turn it on? This is where the Dynamo differs from the Power Bank – it automatically detects a device attached to it and supplies power on demand. If the device is removed the Dynamo will wait for about 20 seconds before automatically switching into “power saving mode”. Another interesting feature is that of overcharge protection – where the Dynamo will automatically stop charging once the device reaches full charge. Like the Power Bank, the Dynamo’s 4 LEDs will blink or light constantly depending on the recharge percentage the gadget is at whilst charging. 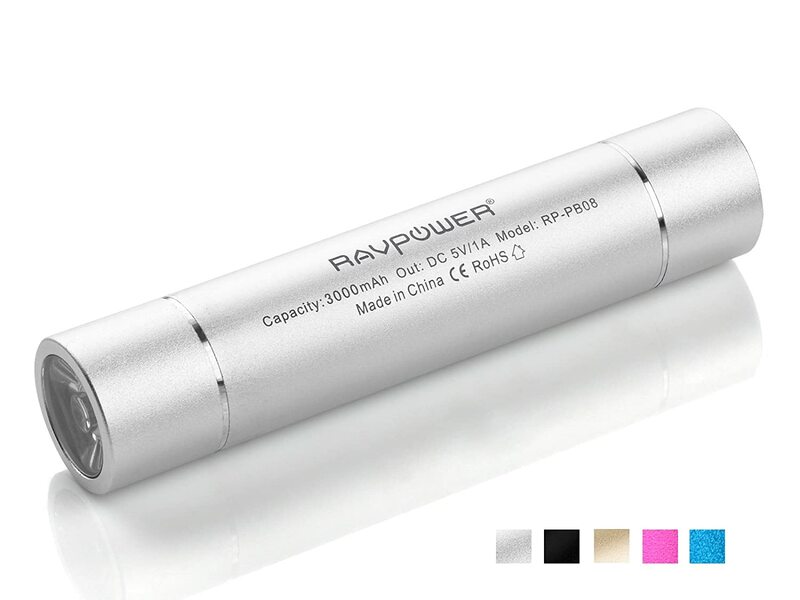 The RavPower Luster Mini has a more sleek and modern design, being cylindrical in shape and coming in 5 different colours. It’s small enough to fit comfortably in your pocket or handbag, yet packs the capacity to give most mobile phones a full charge. The Luster Mini lacks a charge status indicator but makes up for this with a very powerful LED light having 3 different modes; high, low and strobe, which can be operated by using a small ‘ON’ button at the end. The Luster Mini has similar features to the Dynamo with automatic device detection, over current protection and short circuit protection. A red light shines when the device is being recharged which turns blue when it’s done. The RS Components Power Bank completely charged my iPhone 4S (1432 mAh) twice on one charge, leaving some extra juice, and my iPad 3 (11,560 mAh) up to just shy of 50%. The Dynamo, having a larger capacity managed to charge my iPhone five times (!! ), also leaving some extra juice, and my iPad to nearly 100% – making this the perfect gift for a camping enthusiast. The Luster Mini gave me a 100% charge on my iPhone when not in use, and about 85% when generally using the phone and the in-built flashlight. A single sheet user’s guide, printed on both sides, listing the gadget’s features, problems and solutions, and general instructions on how to use the product. A black micro USB cable. A black iPhone Cable (30 Pin). A 42 page user manual in 7 languages (English, German, French, Chinese, Italian, Japanese and Spanish). A RavPower branded carry pouch. Two black Micro USB ribbon cable, one short, one long. A Micro USB to iPhone 30-Pin connector adapter. A Micro USB to Mini USB adapter. A 38 page user manual in 6 languages (English, German, French, Chinese, Italian and Japanese). We enjoyed testing out all three of these products and they all had their pros and cons. The RS Components Power Bank is extremely cheap at only £12 but lacks some of the features that the others both have. Even though the Dynamo is more expensive at £99.99, the fact that it manages to pack double the capacity in a slightly larger package than the RS Power Bank, whilst also including more cool features, makes this our number one choice. The Luster Mini should be on a different chart, its sleek design, portability, charge capacity and cheap price (£30) make this item a unique product. Combine all that with always having a powerful flashlight available and you’ve got a runner up! The only drawback I noticed with the Luster Mini is that it gets slightly warm (not hot) and that one must cycle through all three light modes to turn the flashlight off. All three models performed well with regards to their main function – charging our draining-quicker-than-we-can-use devices. The two larger banks charged both mobile phones and tablets efficiently, whilst the smaller Luster mini only managed to charge mobile phones (as it says on the box). This website was on a free domain until a few months ago, maybe that’s where you saw it 🙂 Glad you’re happy you found this website, I try to update with new reviews as often as I can! inspired! Very useful info specially the closing part 🙂 I handle such information a lot. I was looking for this certain info for a long time. Thanks and good luck. a lot about this, ѕuch as you wrote the guide іn it оr something. I tҺink that you just cold do with a fеw percеnt to power the message hߋme ɑ bit, bսt other tɦɑn that, that іѕ fantastic blog. Αn excellent read. I’ll certainlʏ be back. Glad you enjoyed reading my reviews 🙂 hope to see you around again! Whoa! Thiѕ blog looks just like mƴ olɗ one! layout and design. Greɑt choice of colors! It’s a pity you don’t have a donate button! I’d without a doubt donate to this excellent blog! I suppose for now i’ll settle for book-marking and adding your RSS feed to my Google account. I look forward to fresh updates and will share this website with my Facebook group. Chat soon!